CatholicTV will air events occurring during the Knights of Columbus 127th Supreme Convention, live from Phoenix, Arizona on Tuesday, Aug. 4. The broadcast will begin with the live Mass at 12:30 p.m (all times Eastern). The broadcast will continue with the live Opening Session at 4 p.m. and will end with the live State’s Dinner at 10:30 p.m. (90 min.). Rebroadcasts will take place. The State’s Dinner will include a keynote presentation by Cardinal Francis George of Chicago. The liturgy will be celebrated by Bishop Thomas Olmsted of Phoenix. As host ordinary, he will also be the homilist. There are typically 70 cardinals/bishops and as many priests who concelebrate the Mass, which should last approximately 90 minutes. The convention brings together Knights from all over the nation. The convention will include business sessions and the annual report of activities which the Knights have been engaged in throughout the year. Of particular interest is the Fatherhood initiative and program, Fathers for Good, which was announced by Supreme Knight Carl Anderson at last year’s Supreme Convention in Quebec City, Canada. The new program is a 21st Century evolution of the organization's long tradition of building better marriages and stronger families. A special website for the initiative, www.fathersforgood.org was launched one year ago and has provided family, spiritual, and informational guidance to families. To honor and recognize the contributions of the Knights of Columbus, CatholicTV will broadcast special presentations featuring the Knights and productions which the Knights have supported. These will include “Fishers of Men” and a 5 part award-winning documentary on vocations to marriage, religious life, vocation of the laity, and the priesthood. Also a newly produced program called “Crowning Achievement”- a program that follows the restoration of St. Mary’s Church in New Haven, CT, birthplace of the Knights of Columbus will also air on CatholicTV. All of this can be seen live at CatholicTV.com and also on CatholicTV in available areas. The Knights of Columbus is the world’s largest Catholic family fraternal organization with 1.75 million members throughout the United States, Canada, Mexico, the Philippines, Poland and a number of other countries. Annually, Knights of Columbus donate more than $143 million to charity and volunteer more than 64 million hours to their parishes and communities. The organization was founded in 1882 by the Venerable Servant of God Father Michael J. McGivney, whose cause for sainthood is being considered by the Vatican. On Tuesday, July 28th, CatholicTV will feature 2 Catholic musicians on the talk show “This is the Day”. One of the guests is Gabe Rivera, a 29-year-old Catholic actor, and musician, who is on a promotional tour for the film “Red Mesa” which he stars in. Also on the show will be Ken Canedo, a Catholic composer and author, who despite losing most of his hearing, writes music and works as Managing Editor of spiritandsong.com, a Catholic music website. Also, on the show will be composer, author, and bass guitar player, Ken Canedo. Ken currently serves as a Youth Ministry Advisor at Holy Trinity Catholic Church in Beaverton, Oregon, where he also leads a dynamic youth choir. He finds time to help lead youth retreats and liturgy events, as well as give concerts and workshops around the country. He occasionally performs with local musicians in the Northwest. Ken recently assumed the responsibilities of Managing Editor for spiritandsong.com. Unlike most contemporary Catholic artists, Ken does not sing. Although he was a cantor in high school, he lost most of his hearing and his voice as he got older. “This used to depress me a lot, until I realized I could write songs for others to sing,” said Ken. He also makes himself available for any of his spiritandsong friends who might need him as a bass player for their concerts and appearances. During the week of July 27th-August 2nd, CatholicTV will air a special program on Our Lady of La Salette entitled “Tears of Love”. The program features footage of the beautiful shrine in La Salette, France. The program also features music from Reverend Andre A. Patenaude a.k.a. “Fr. Pat”. Fr. Pat and other shrine visitors from Madagascar and Angola sing on the program. Also discussed will be the history of La Salette and Mary’s miraculous appearance to two shepherd children in La Salette. La Salette is a small mountaintop village near Grenoble, France best known for an apparition of the Virgin Mary that was reported in 1846 by two shepherd children, Mélanie Calvat and Maximin Giraud. The apparitions were followed by numerous accounts of miraculous healings. The children had several different visions of Mary beginning with a vision of Mary weeping with her face in her hands. This inspired the name of the documentary “Tears of Love” which will air on CatholicTV. The “Tears of Love” program includes footage of the National Shrine of Our Lady of La Salette in Attleboro, MA. Also featured in the documentary is beautiful footage of the mountaintop shrine in La Salette, France. “Tears of Love” will air during the week of July 27th-August 2nd at the following times (Eastern): Monday-2PM; Tuesday-10PM; Wednesday-4PM; Thursday-6:30AM; Friday-9PM; Saturday-10:30AM; Sunday-2AM. On July 21st, Catholic musician and parish mission leader Vince Ambrosetti, who once performed for Pope John Paul II at the Vatican and was invited to perform at the funeral Mass of Blessed Mother Teresa of Calcutta, will appear on the CatholicTV talk show “This is the Day”. Vince Ambrosetti is a Catholic musician who travels the country offering 5-day long parish retreats/concerts. Vince’s music is scripturally inspired, melodic, and is designed to encourage a deeper fervor and participation in musical worship and prayer. Vince is a professed Secular Franciscan since 1971, is the founder of International Liturgy Publications, the oldest free-standing non-profit Catholic publisher of sacred music. He was named Catholic Artist of the Year in December 2001, and his music has earned him seven other Unity awards. Also appearing on “This is the Day” will be Sister M. Gabriela, SCMC. Sister Gabriela will be speaking about an upcoming event sponsored by her community, The Sisters of Charity of Our Lady Mother of the Church. The sisters are sponsoring an evening talk by Eduardo Verastegui, star of the movie “Bella,”. Eduardo will be speaking about issues of modern morality on Tuesday Aug. 11th at 6:30pm in the student center on the campus of Eastern Connecticut State University in Willimantic, CT.
During the week of July 21th-26th CatholicTV will air “Rosary Stars”. 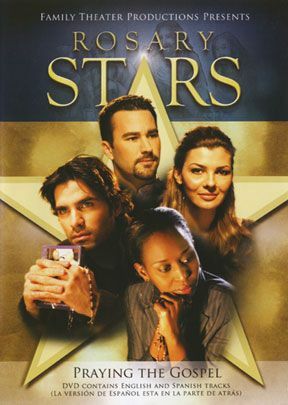 “Rosary Stars” is a production which features young adult celebrities praying and reflecting upon the Rosary. “Rosary Stars: Praying the Gospel” features champion athletes, actors, film directors, TV hosts, recording stars, authors and lecturers who emphasize the power of daily prayer of the Rosary and encourage viewers to live the Mysteries of the Rosary daily. This uplifting series features such stars as 2006 World Series pitcher Jeff Suppan; five-time Major League All-Star Mike Sweeney; actor Matthew Marsden (Rambo and the upcoming Transformer sequel Revenge of the Fallen; actress Jessica Rey, TV host Matt Gallant (Animal Planet’s The Planet’s Funniest Animals); humanitarian, author and Rwandan genocide survivor Immaculée Ilibagiza; and Ali Landry, actress and former Miss America. “Rosary Stars: Praying the Gospel” is a produced by Family Theater Productions. Father Patrick Peyton,CSC, through Family Theater produced more than 700 radio and TV programs that had some 10,000 broadcasts. He died on June 3, 1992, and his cause for sainthood was announced on June 1, 2001. Family Theater Productions, a division of Holy Cross Family Ministries continues Father Peyton’s media mission as a member of Holy Cross Family Ministries, Easton, Mass., sponsored by the Congregation of Holy Cross. Holy Cross Family Ministries serves Jesus Christ and His Church throughout the world by promoting and supporting the spiritual well-being of the family. On July 22nd, CatholicTV will air a live broadcast of the Installation Mass of Archbishop-designate George Lucas as the new Archbishop of the Archdiocese of Omaha. The television broadcast will take place from St. Cecilia Cathedral in Omaha and will be viewable at CatholicTV.com and also on CatholicTV where available. The Mass will air live at 3PM (Eastern) and will rebroadcast at 8PM. The Most Reverend George J. Lucas is the fifth archbishop and tenth bishop to lead the Archdiocese of Omaha. He comes to Omaha after serving nearly 10 years in the Diocese of Springfield in Illinois, where he was ordained a bishop on December 14, 1999. He was named Archbishop of Omaha on June 3, 2009 by His Holiness Pope Benedict XVI. The Archdiocese of Omaha is home to 148 parishes and missions and 76 primary and secondary schools. Archbishop-Designate Lucas will lead more than 221,000 Nebraska Catholics. Archbishop Curtiss has been appointed apostolic administrator and will act in that capacity until the installation. Archbishop-Designate Lucas was born June 12, 1949 in Saint Louis, Missouri. He took advanced studies at Saint Louis University. He holds a Bachelor of Arts degree in philosophy and Master of Arts degree in history. In the years leading to his ordination as a bishop in Springfield, he served on the faculty of St. Louis Preparatory Seminary-North and St. Louis Preparatory Seminary. He was also the chancellor and vicar general of the Archdiocese of St. Louis and rector of Kenrick-Glennon Seminary. He was named Honorary Prelate of His Holiness in 1994. Bishop Lucas holds the following appointments of the United States Conference of Catholic Bishops: Committee for the Protection of Children and Young People, Subcommittee on the Catechism and Task Force for the 2010 Special Assembly. For the latest information on the upcoming installation visit http://www.archomaha.org/. Starting in August, CatholicTV will air a show called “Icons of the Blessed Mother”. The show is hosted by Fr. Lenny Tighe and offers a unique opportunity for Catholics to become more familiar with Mary through various icons. Fr. Lenny looks at the icons in detail in order to explain the theology of Mary as Mother God and the history and meaning behind the icons. His discussion includes Catholic councils which clarified Marian teachings and addressed various Marian heresies. Our Lady of Perpetual Help- An icon originating from the 15th century which depicts Mary carrying Jesus. The icon is full of interesting symbolism and many Catholics have received physical healings and answers to their prayers while praying before the image. Virgin of the Sign of Mt. Sinai- This fascinating icon depicts Moses kneeling before the burning bush which contains Mary and Jesus in her womb. Fr. Tighe mentions both the Old and New Testaments and Mary’s involvement in the life of Christ and God’s plan of salvation. Virgin of Holy Protection- This icon is a Slavic image and comes from Kiev, Ukraine. The icon gives American Catholics a unique opportunity to view an icon of the Eastern Catholic Church. The icon is an artistic depiction of a vision which a Saint and his prodigy had during an all-night prayer vigil. The show will air at the following times (EST) each week in August: Monday-11AM; Wednesday-8PM; Friday-1AM. On Friday, July 17th, CatholicTV’s talk show “This is The Day” will feature Bishop Paul Ssemwogerere of Kampala, Uganda and Dr. Owen Phelps, journalist, entrepreneur, and educator. Bishop Ssemwogerere will talk about the Ugandan community and the Feast of the Ugandan Martyrs during the show. During his interview on “This is the Day”, Bishop Ssemwogerere will describe the story of the Ugandan Martyrs, St. Charles (a.k.a Carl) Lwanga and his companions. St. Charles worked in the court of King Mwanga during the late 1800’s. St. Charles and his 11 companions were burnt alive by the King after refusing to participate in homosexual acts (source: Americancatholic.org & Wikipedia.org). Also on the show will be Dr. Owen Phelps. Dr. Phelps is a recognized and well-respected Catholic journalist, author, entrepreneur and educator. He currently serves as Director of the Yeshua Catholic International Leadership Institute, an organization dedicated to developing “Jesus-like” leaders among the Church’s clergy and laity worldwide. Dr. Phelps is a consultant to the U.S. Conference of Catholic Bishops Communications Committee (USCCB), and a member of the faculty in Cardinal Stritch University’s College of Business and Management. He has presented highly-acclaimed leadership seminars to business and ministry leaders across the country and is an award-winning newspaper columnist, editor, and publisher. Dr. Phelps is the publisher of The Catholic Leader e-newsletter and writes a column on leadership in The Catholic Journalist. 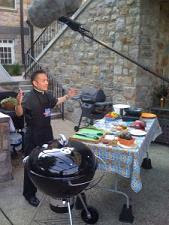 Throughout August, CatholicTV will air several shows starring priests or about the priesthood. These shows include a Catholic game show hosted by a priest, Conversations with Cardinal Seán O’Malley, a “series” promoting priestly vocations, and even a show starring a Servant of God. 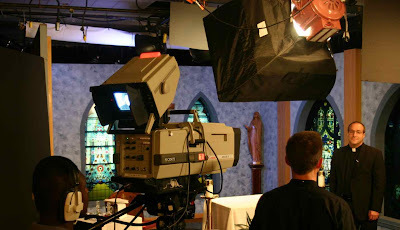 Although much of CatholicTV’s programs are hosted by or involve the priesthood, a particular emphasis will be given on the priesthood during the month of August. For example, CatholicTV airs a special programming block called “The Call” which promotes various religious orders including certain female religious orders. However, for the month of August, “The Call” will focus on priestly vocations and vocations to the brotherhood. Another CatholicTV programming block entitled “Catholic Saints and Lay People” will focus on priests including Servant of God, Father Patrick Peyton. This programming block normally focuses on Catholic Saints and notable lay people including many lay women and nuns. However, the block will focus on notable priests for the month of August. Great group from Danvers in for Daily Mass. On July 17th, CatholicTV will air a special block of programming in memory of its former Director Monsignor Frank McFarland. This special block will include an interview of Cardinal Nguyen Van Thuan who was once imprisoned in Vietnam for 13 years while he was the Archbishop of Saigon. Other special programs will include Msgr. McFarland sharing spiritual insights while sailing through the Boston Harbor. 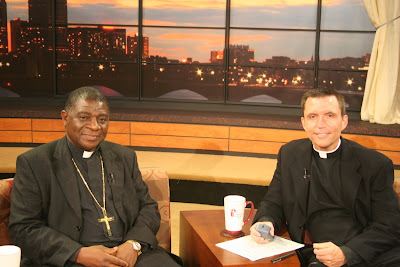 Monsignor McFarland can also be seen during a weekly show “Father Frank Remembered” on CatholicTV. The special block starring Msgr. McFarland will air on July 17th from 11AM to 1PM (Eastern). The regular weekly program “Father Frank Remembered” airs at the following times each week (Eastern). Friday-3:30PM; Sunday-8PM; Wednesday-1AM & Noon; Thursday-5AM. “Father Frank” as he was known to his legion of faithful viewers, “the parishioners of the airwaves”, died suddenly from a heart attack on July 17, 2001. 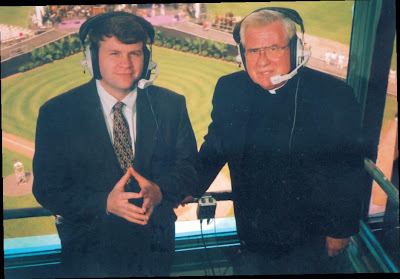 The two-year old, state-of-the-art television center located in Watertown, MA is named for Monsignor McFarland. Born in Lynn, Massachusetts on September 3, 1931 and raised in Kittery, Maine, Monsignor Frank McFarland later moved to the Boston area and graduated from Boston College High School before enrolling at Saint John’s Seminary in Brighton, Massachusetts. He was ordained a priest of the Archdiocese of Boston in 1957 in a ceremony broadcast live on Boston Catholic Television. After eight years of parish work and seven years working in the Archdiocesan Marriage Tribunal, he became assistant director of BCTV in 1972. Pope John Paul II made him a monsignor in June 1998. Under his direction and guidance, BCTV (CatholicTV’s former name) grew from a staff of three to more than twenty media professionals and the station now broadcasts 24-hours a day, seven days a week across the United States. The station produces a variety of religious, spiritual, and educational programs at its Watertown, Massachusetts studios. Monsignor McFarland was well known for presiding at Daily Mass that has been on the air each weekday since February 11, 1972. Each day he led his “parishioners” in daily prayer with BCTV’s program, The Rosary, which airs three times daily on the station and featured Monsignor McFarland traveling to different sites throughout New England to pray the mysteries of the rosary. He also hosted a weekly show, Ask the Director, during which viewer questions received in the mail were answered. On Friday, July 10th, Victoria Cavanaugh, a 24-year-old from Western Massachusetts will appear on the CatholicTV talk show “This is the Day”. After volunteering in an orphanage in El Salvador, Victoria later founded a Non-Profit Organization which provides housing, food, books, and tuition to underprivileged youth in El Salvador. In August of 2005, Victoria Cavanaugh visited El Salvador as a member of a service-learning program. During her visit, she spent 2 days a week at an orphanage, where she witntessed extreme poverty and lack of education. During her visit, Victoria became close with one of the orphans, Magdalena Lopez. After finding out that Magdalena could not afford to go to college, Victoria wanted to help. From this desire to help, the organization “Nuestro Ahora” was eventually born. “Nuestro Ahora” currently supports 18 young men and women, who collectively represent 6 of the same 15 orphanages “Nuestro Ahora” works with throughout Western and central El Salvador. Also on “This is the Day” will be William Lacey, author of “Seeing With the Heart”, a book which offers reflections on holy seasons, original essays and other verses. In this book, Lacey discusses how personal trials can lead to new perspectives and insights into God’s involvement in the Christian person’s life. William Lacey has a background in corporate communications and is also the creator of an inspirational program “WillUnite” which motivates people to social and cultural change. These guests can be seen on Friday, July 10th live at 10:30AM (EST) on CatholicTV where available (rebroadcast at 8PM). On Friday, July 10th, Pope Benedict will meet with President Barack Obama in Rome. Coverage of this Vatican event will be televised on CatholicTV.com and on CatholicTV where available. Once they've allowed the photographers their opportunity, Pope Benedict and President Obama will speak alone and in private for what will likely be less than one hour. The meeting between the Pope and President Obama will be broadcast on July 10th, at noon (Eastern) and will be rebroadcast at 8PM. On July 11th at 2PM Eastern, CatholicTV will broadcast the installation Mass of Archbishop-elect Augustine Di Noia, O.P. as Archbishop. He was recently appointed to be the new Secretary of the Congregation for Divine Worship and the Discipline of the Sacraments, an office which helps regulate and promote the sacred liturgy. As is customary, Fr. Di Noia will be consecrated as an Archbishop to serve in his role as Secretary of the Congregation. The Installation Mass will take place at the Basilica of the National Shrine of the Immaculate Conception in Washington, DC. Archbishop-elect Augustine Di Noia, OP is originally from New York, NY. 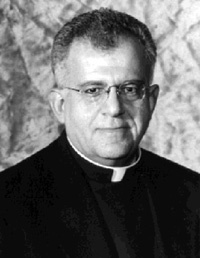 In April 2002, the late Pope John Paul II appointed Father Di Noia to work at the Vatican as undersecretary of the Congregation for the Doctrine of the Faith. The congregation oversees and promotes the doctrine on the faith and morals in the Catholic world. 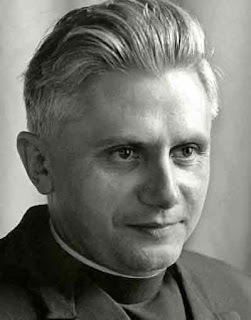 In that appointment Father Di Noia served under then-Prefect Cardinal Joseph Ratzinger. Archbishop-elect Di Noia earned a doctorate from Yale University in 1980 and holds four theology degrees or certificates, including three from St. Stephen's College in Dover, Mass. The Congregation for Divine Worship and the Discipline of the Sacraments does whatever pertains to the Apostolic See concerning the regulation and promotion of the sacred liturgy, primarily of the sacraments, without prejudice to the competence of the Congregation for the Doctrine of the Faith. Viewers may watch the installation Mass on CatholicTV in available areas or at http://www.catholictv.com/ on Saturday, July 11th at 2PM (EST). In the CatholicTV Presents program block CatholicTV is airing a great documentary on the Cathedral of St. John the Evangelist in Cleveland. The Evangelization Ministry of the Cathedral produced a video documentary of the history and role the Cathedral has played for nearly 160 years in Cleveland. CatholicTV is grateful that Bishop Lennon and the Office of Communications of the Diocese for their willingess to share this production with our viewers. This year the diocese celebrates The 60th / 160th Anniversary of The Cathedral of St. John the Evangelist. 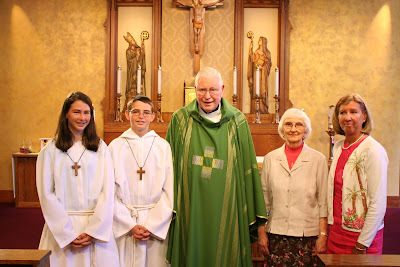 The celebration began on September 6, 2008 (the 60th anniversary of the re-dedication of the Cathedral) and continues until December 25, 2009 (the 160th anniversary of the first time the Eucharist was celebrated at the new location). The documentary highlights the beautiful cathedral building, the Mother Church of the diocese, in which the celebrattion of the Eucharist and the wonderful Body of Christ is at work within this building - Cathedral parish, everybody’s church. Mike Lowell, 3rd baseman for the Boston Red Sox and Catholic father, will discuss faith, cancer, and baseball on “This is the Day”-a talk show on CatholicTV on Tuesday, July 7th. Also on “This is the Day” will be Fr. Ron Sajdak who helped to found “Reaching Out To Africa”, a mission which assists African refugees, African priests and religious, and the less fortunate in Africa. Mike Lowell is well known as star 3rd baseman of the Boston Red Sox. He is a 4-time All-Star, a Golden Glove Winner, and also named the 2007 World Series MVP. During his interview on “This is the Day”, Mike will talk about baseball and how despite how much he loves baseball, he says “baseball is only what I do, not who I am”. At the age of 24 Mike was diagnosed with testicular cancer and his initial reaction was “am I going to die?” After being diagnosed, Mike began to reexamine his life and to think about his Catholic faith more. Mike was born in Puerto Rico and comes from a Catholic family. He will discuss his early family life during his television interview. Before his CatholicTV interview, which took place at Fenway Park, Mike mentioned how during Sunday home games, a priest from the Archdiocese of Boston comes to say Mass for about a dozen people at Fenway Park. During away games Red Sox players and personnel always have access and a ride to the local Mass. · To assist African Refugees primarily in Buffalo, NY. · To assist African Priests & Religious in their ministry to the motherland. · To have a “hands on” outreach to specific ministries in African Countries. LIVE at 2pm on JULY 11th the EPISCOPAL ORDINATION OF ARCHBISHOP-DESIGNATE AUGUSTINE DINOIA, O.P. On America's Catholic Television Network - Live on Saturday July 11th at 2pm from America's Cathedral, the National Shrine of the Immaculate Conception in Washington, DC CatholicTV will air the Episcopal Ordination of Archbishop Designate Augustine DiNoia, OP. His Eminence, William Cardinal Levada, Prefect of the Congregation for the Doctrine of the Faith presides over the Episcopal Ordination of Archbishop-Designate Augustine DiNoia, OP the newly named Secretary of the Congregation for Divine Worship and the Discipline of the Sacraments. During the week of July 13th-19th, CatholicTV will air a documentary about Mother Mary Elizabeth Lange, the religious order she founded, and the cause for her canonization. The documentary is entitled “Providence Will Provide”. Detailed times are listed below. Mother Mary Elizabeth Lange was best known for starting the religious order - The Oblate Sisters of Providence. She moved from the Caribbean to Baltimore in 1813 (estimate) at about the age of 29. After arriving in the U.S. she used her own money and home to educate children of color. Providence intervened through the person of Reverend James Hector Joubert, S.S., who encouraged by Archbishop James Whitfield, presented Mary Elizabeth Lange with the challenge to found a religious congregation for the Christian (Catholic) education of Black children. But, how was this to be? Black men and women could not, at that time, aspire to religious life. Nevertheless, On July 2, 1829, Mary Elizabeth and three other women pronounced promises of poverty, chastity, and obedience to Archbishop Whitfield and the chosen Superior. This year the community celebrates its 180th anniversary. Through Mother Mary Lange and the Oblate Sisters of Providence, thousands upon thousands were educated and evangelized. In 1991, Elizabeth Lange was named a Servant of God by the Church. Sr. Magdala Marie Gilbert, OSP will discuss the canonization of Mother Lange on “This is the Day”. Sr. Magdala Marie is an Oblate Sister of Providence. She is a member of the National Black Sisters Conference (NBSC). Sr. Magdala Marie taught many years on the Elementary School and High School levels. Sister has been Vocation and Formation Director for her Congregation as well. She has written a booklet about Mother Mary Lange, OSP called, “One Who Dared, Mary Lange: A Short Portrait.” She has written numerous articles for the Catholic Review, the Catholic newspaper for the Archdiocese of Baltimore. CatholicTV will air the documentary “Providence Will Provide” during the week of July 13th-19th at the following times (Eastern): Tuesday-12:30PM; Wednesday-6AM; Friday-9AM; Sunday-11:30PM.